Visit their webpage by clicking here. 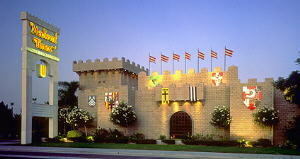 The "Medieval Times" castle in Buena Park is, of course, part of the national mini-chain of such establishments (I know of one in Dallas and in Orlando and elsewhere, too) but it has a different history than the others. It originally opened as the "Dream of the Wild Horses" attraction and presented a dinner show not of knights and jousting as they do now but an immitation of the Royal Lippizaner stallions of Austria's famous "Spanish School" of ridership and dressage. That's why the "castle" is much more Spanish-themed than the more French/English style "castles" in the other MT locations, and frankly is a much more beautiful building inside, with lovely Spanish-style courtyards and stonework---of course, it also drew on the local California builders with experience doing Spanish-style architecture that's a common local housing and commercial building style harkening to our own history with the Spanish Missions.